tradition at the Delaware RIver Club. We are pioneers in flyfishing instruction. Beginning over 22 years ago, we believe weve set the industry standards at every level on teaching flyfishing. Our teaching techniques have been developed and proven effective with thousands of individuals over every kind of flyfishing situation. Our knowledge of fish habitat, insect life, and imitations is unsurpassed. And we truly enjoy working with our students to share our love and knowledge of the sport. 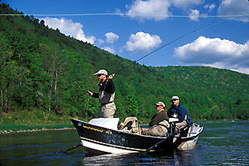 Our instructors are among the finest in the country (14 in all), many have 10 to 20 years experience on the Delaware, are NY licensed, certified guides, superb casters, fly tiers and angler/entomologists. I fish with them and personally taught them about the Delaware system and its hatches. 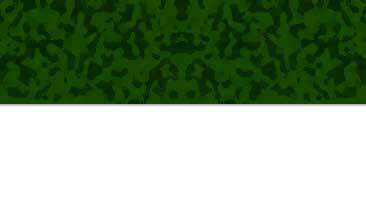 They are extraordinary fly fishers and friendly professionals of the highest order. We also have a few bright young guides who have picked up the program quickly. Our facility is on the finest wild trout river east of Montana, featuring the best pools on the blue ribbon West Branch. No fancy stuff - just large comfortable clean rooms with gourmet dining exclusively for students, staff and returning customers. We have a unique fly shop that has everything you need to help you become a master fly fisher. When you inquire about other flyfishing schools, make sure they can meet the above criteria - you deserve nothing less. O.K., so you've been fly fishing for years, in fact, you're pretty good and consider yourself in the upper 30%, and you would never consider (dare I say the word) flyfishing school. WRONG! This program has nothing to do with our Basic School. It includes: 2-1/2 days of hatch match guided fishing, 3 mornings of tune up clinics on casting, presentation, entomology, flies and more, 2 nights lodging and 8 gourmet meals (3 meals on Friday and Saturday and 2 on Sunday) by Chef Fabio from Lake Como, Italy. Plus 2 cocktail hours with hors doeuvres, wines and beer and lots of fun! Free loaners of top of the line equipment for you to test and fish with. I personally teach and guide in this program. My guides and I are with you from 8:00 A.M. until 10:00 or 11:00 P.M. We fish, eat, talk and sleep trout fishing for 3 days. It's a must experience for trout fishers at any level. I designed these programs for the intermediate and advanced fly fisher to improve your presentation for selective trout. Many experienced anglers get frustrated on the Delaware because they don't understand the habits of wild, selective trout and the insects that they feed on. We concentrate on solving the hatch problems on the river, selecting the proper imitations, then making the proper approach and presentation. 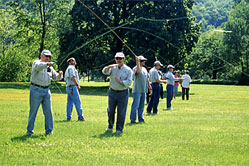 Fishing with nymphs, emergers, duns and spinners is a part of this program. Now in our 22nd consecutive season on the West Branch! 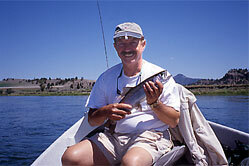 Learn to fly fish with my friendly, expert staff with an instructor at your elbow. We teach all the basics, but what separates us from the others is that we teach you to fish on the river over wild trout. We point out rising fish and explain what flies theyre taking and why. We are a 'hands on' flyfishing school -- by the end of the first day you will be casting to wild trout on our beautiful private stretch of the West Branch. Casting, fly selection, bug identification, nymph, streamer and dry fly presentation are all part of the program, plus much more. Save yourself years of frustrating trial and error by learning the proper way, on the river, in just 3 days and have lots of fun in the process. Schools are filling up fast, so give us a call soon. A $250 deposit is required with your registration. Balance due 30 days in advance of the school date selected. Casting to a sipping trout on The West Branch. Our seasoned wade and float guides are licensed, certified and have all been personally taught by me and have many years of experience on the Delaware. They know the river's moods and hatches. Each is a superb fly fisherman, caster and fly tyer. Our float and wade guide service begins in early April and continues through November. In the past we have been known mostly for our schools. Over the years, our guide service has grown significantly into one of the largest in the country and the best on the Upper Delaware with 14 full and part time river guides. Most of our staff have been instructing and guiding with me on the Delaware for at least 10 years. Our younger guides are cream of the crop, bright, well educated, upbeat, polite and very talented. I take great pride in the knowledge that each of my staff is a superb flyfisher, caster and they all know their bugs; professionals who are dedicated to giving you the best fishing opportunities the river has to offer. May and June are busy months on the Delaware. If you intend to hire a guide during this time, I suggest you reserve your dates early (before March). My favorite months on the West Branch and main stem are April, July, August and October. 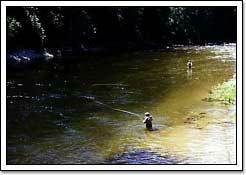 The dry fly fishing is usually superb during these months and there is very little fishing pressure. The weather is wonderful in July and August, lots of hatching and rising trout and plenty of icy cold bottom releases with water temperatures in the 50s. If you have any questions about our guide program, feel free to call me at any time. Fish the Delaware with the best! ( $100 deposit per trip ). $325 per day for 1 or 2 anglers, $350 for 3, includes lunch. $225 for 1 or 2 anglers, $295 for 3, - half day, no lunch. $350 for 1 or 2 people - includes lunch. $250 for one or two people - half day, no lunch. Two day private and semi-private schools (2 or 3 students) are available. These programs are customized for people with limited time or wanting special tutoring. Programs are similar to basic or advanced Delaware River courses described above. April to mid-November, 2 days of instruction and use of equipment. Sorry, lodging and meals are NOT included. $550 for one person, $450 each for two persons, $400 each for three. $150 deposit per person required. Covers casting instruction, knots, and on-the-river casting to wild trout with dry flies and nymphs. Does not take the place of our famous 3 Day School, however, it will get you started in fly fishing and give you a great overview. $275 for one person, $195 each for two or three people. Includes use of equipment. Sorry, meals not included. $100 deposit per person. Designed for the intermediate and advanced angler. 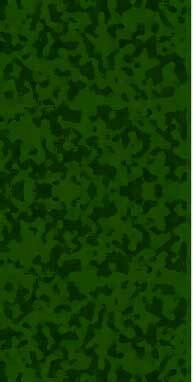 Includes instruction on advanced casting and on-the-river fly presentation to wild trout; dries, nymphs, emergers, and streamers with floating and sinking lines. $275 for one person, $195 each for two or three people. Includes use of equipment. Sorry, meals not included. Both courses are available any day except on weekends of group schools listed. $100 deposit per person. registered 13 lbs. for this bone! I've stated many times over the past 10 years, that Andros is by far the best bonefish destination in the world where you can catch large numbers of bones as well as large bones, 5-10 pounds on a regular basis. Plus you have a chance to hook a world record bonefish every time you venture out on the flats. This is not normal with bonefish destinations. Except for the Keys, bonefish average 2-3 pounds at other destinations. About the trip: We stay at Small Hope Bay Lodge in cottages right on the beach. This is not just another fishing camp, but a classic, informal resort with miles of beach front, great food and an open bar. Everything is included in the price. While were bonefishing on the flats, your non-fishing companions will love the activities at Small Hope Bay Lodge; swimming, sunning, diving, snorkeling, touring and sailing. Its a real fun vacation, not just a fishing trip. Our unique program is designed for both the first time bonefisherman and the experienced bonefisherman. We do not have lengthy seminars and we do not waste time with numerous casting clinics. Rather, after one day of critical clinics, we spend our time teaching you on the flats, with an instructor at your elbow. I guarantee you will learn to bonefish. You dont need super skills as many would have you believe. If you can cast 35 to 40 feet, we will teach you to catch bonefish. Experienced bonefisherman can skip the clinic and get an extra day on the flats. Many in our past programs hooked bonefish over 10 pounds and several have landed bonefish between 12 and 16 pounds. In good weather you can average over 10 bonefish per day. Dont take my word, ask for our large list of references who keep coming back time and time again. I select the very best guides on each Island. Due to my 17 years experience in Bahamas bonefishing (2 months per year), I know the best guides on a personal basis and I book them 12 months in advance. You won't get stuck with an inexperienced or unsuitable guide with us. All of our guides are the cream of the crop, respected independents with high quality instructional skills. I run my programs during prime season - late March, early April, late October and November (May and June are too hot and rainy and December through early March is too risky with cold fronts). March and November are when the big, double digit bones are on the flats and aggressive. It's your best chance to get numbers and size. It's also nicer to go to the Bahamas during this period - the weather is in the 80's with water temperatures in the high 70's, while back home is just plain yucky. Value. If you've traveled in the Bahamas you already know that a package price is much different that the final bill. Gratuities, guest taxes, bar bills and ground transportation can bring your bill to a much higher number that than the advertised price. With the Al Caucci Fly-fishing Program, prices are all inclusive. That's right, even your bar bill is included! Most of all, we have one helluva great time! Program was designed for both the angler and non-fishing spouse. $2795 per angler and $1095 per non-fishing person. Trip includes ground transportation, gratuities, 5 nights and 6 days in oceanfront cottages, 3 delicious American and Bahamian meals per day, 1 day of fishing clinics, 3 or 4 days of guided tutored fishing from modern bonefish skiffs. Advanced fishers have 4 days of guided bone fishing (free ground transportation to all bonefish areas). Includes everything except tips for guides and air fare. There’s a FREE open bar, free introduction to scuba and snorkeling lessons and equipment and much more. $1200 deposit per fisherman is required with your registration, $600 per non-fishing person. Full payment is due 60 days prior to date of trip. Program is the best of all worlds. I have combined the best of my guides with the best of the Andros Island Bonefish Club and we have the option of fishing the North and Middle Bights, Youngs Sound and the West Side on a daily basis. 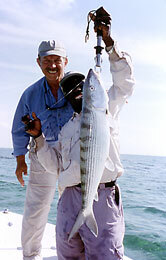 Trip is designed for skilled and first time bonefishers. Trip includes: Ground transportation, 5 nights, 6 days in beautiful creek/ocean view cabins with air conditioned rooms, modern baths and refrigerators, 3 delicious meals per day, 4 days of guided fishing from modern, fast, bonefish skiffs with the best guides in the Bahamas. Also, free drinks during cocktail hour; bottled water and pop in boats; includes room taxes and laundry service. Everything is included except gratuities and air fare. Cost of the program is $2795, based on two anglers per room and two persons per guide. A deposit of $1200 is required at registration, full payment is due on January 15, 2006. We have revised and improved our very popular and successful Missoula trip, now in its 12th consecutive year. I cant be more emphatic about the quality of the rising trout/dry fly sight fishing on the lower Clark Fork (and the Bitterroot). Big wild rainbows and browns sip mayflies and caddis and zip straight into your backing. In the past two years weve been hooking 30 to 50+ fish per float - and these are sipping fish in the 16-1/2 to 23 class. Floats start 9:00ish in the A.M., and go to dark in the P.M. and includes our mid afternoon streamside alfresco dining on the river. Delicious grilled elk or beef, duck or pheasant with salads, veggies and breads Bottles of Merlot, Cabernet and Chardonnay, whatever you like, topped off with a nice cigar (if you wish). Then its back to sipping trout until dark. The guided wade trips are close by, start after breakfast and go to 2 P.M. Then its back to the lodge to relax and freshen up, followed by a late afternoon dinner at one of the best restaurants in town. Were back on the river by 7 P.M. and we fish the evening hatch and spinner falls until dusk (around 10 P.M.). The Clark Fork trip, combined with the Missouri River trip should be the best two weeks of dry fly fishing of your life! Dont miss it! Price includes 6 nights and 6 days of action packed fly fishing on the lower Clark Fork and Bitterroot Rivers, 5 full days of guided float fishing, 1 evening wade trip on arrival day, plus all ground transportation and all meals. We will stay at the luxurious Double Tree Inn in large balcony rooms overlooking the Clark Fork. Price is $2495 with 3 guided float days and 2 guided wade days and $2795 for 5 guided float days, double occupancy, 2 persons per guide, and includes everything except air fare and tips for guides. $1,300 deposit is required for reservation. Balance is due May 9, 2006. 7 Days of spectacular guided fishing for ‘big’ Alaskan rainbows with dry flies – considered the best rainbow fishing in the world for sheer numbers of trout and size (17”-30”). The price includes all meals, guides and boats, lodging, beer, wine, soft drinks, all fishing tackle (if you decide not to take your gear), 1 night in Anchorage and 6 nights, 7 days at Katmai Lodge on the Alagnak River. Everything is included except air fare, tips for guides/staff and fishing licenses. Trip has been in the $5000 range- call 570-629-2962 for 2007 price. 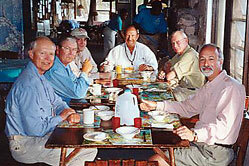 Deposit for 7 day trip is $2,500 ($1000 due before April 2006 $1500 due on August 31st). Balance is due April 7th, 2007. This trip sells out quick so get your deposit in ASAP. We highly recommend trip insurance. Note: Your registration will be confirmed in writing upon acceptance of your deposit. We will send you directions to the DRC and a checklist of what you will need. Full payment is due 30 days prior to Delaware School, wade guide and float trip dates, 60 days prior to Rocky Mountain and Bahamas Programs and 90 days prior to the Alaska trip. No refunds after these deadlines. We strongly urge trip insurance. Please make checks payable to AL CAUCCI FLYFISHING and return the enclosed form with your deposit. Thank you.